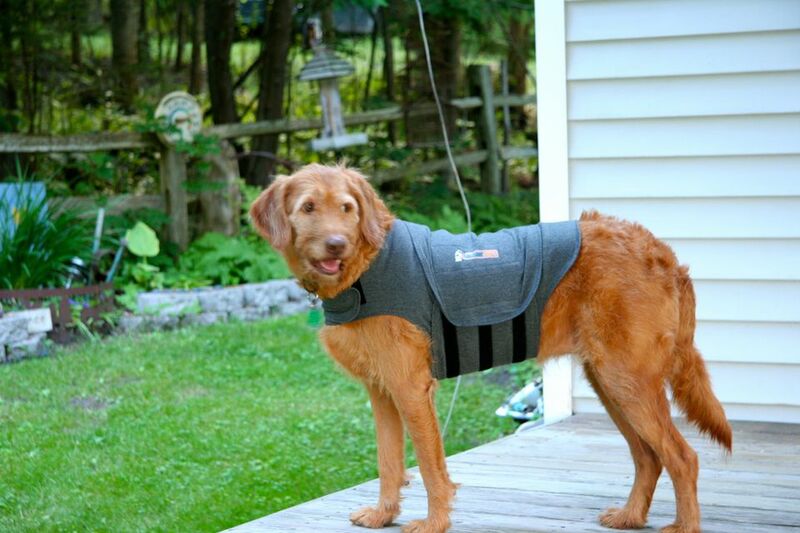 Does Thundershirt Calm Dog Anxious Dogs? The idea seems almost too simple to work: a constant, gentle-pressure "hug" that calms an anxious pet's nervous system. Based in part by the work of Temple Grandin, noted author, Doctor of Animal Science, and professor at Colorado State University, the Thundershirt is designed to calm pets who are afraid of loud noises (fireworks and thunder) and other anxiety-based behaviors. It is an easy, relatively low-cost, and drug-free product to try out on pets who suffer from various anxieties. My own dog slept through fireworks wearing it, so I will definitely continue to use the Thundershirt as needed for anxious times. The Thundershirt is a snug-fitting garment that helps to calm dogs by applying gentle, even pressure around the dog's torso. It is believed that the pressure helps release calming hormones. Once a dog is familiar with the Thundershirt and can wear it comfortably, the garment can be left on for extended periods but should be removed at least twice a day. We have used a DAP collar in the past to help calm Sophie during the 4th of July, with amazing results. But this year, the fireworks seemed even crazier than before, and I did not have a DAP collar. On the first night of fireworks, Sophie became upset—pacing, panting, whining, wanting to hide in the closet. I forgot I had the Thundershirt and made a makeshift one. I think it helped. Then, on the next night, I remembered the Thundershirt and put it on Sophie. It fits perfectly in all the right places. It is well-constructed and snug without being too tight to cause discomfort. She laid down right away. That was a great first step. When it was time for bed, and the fireworks were still going on (ugh), I left the Thundershirt on Sophie. She fell asleep, which meant I could, too. The real test came at 5 a.m. We awoke to a continual bam-bam-bam of more fireworks. I checked on Sophie, and she was sound asleep. This is not typical for her. In a situation like this, she would normally be nudging me awake, whining, and pacing. After that trial by fire(works), I would recommend this product for any pets who suffer from loud noise phobias and other anxiety-based problems. At least it's worth a try, whether you're using it alone (for mild cases) or in conjunction with other therapies.